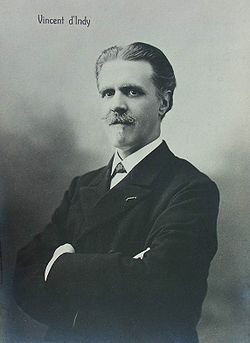 Paul Marie Theodore Vincent d'Indy (27 March 1851–2 December 1931) was a French composer and music teacher. Born in Paris, he was encouraged to learn music by his uncle who had studied with César Franck. D'Indy later also studied with Franck at the Paris Conservatoire. He liked the music of Lizst, Beethoven and Wagner. He went to the first performance of Wagner's Ring at Bayreuth in 1876. He organized performances of works by Rameau and Monteverdi whose work had been mostly forgotten. He was a very conservative in his views on music, and after his proposed changes to the Conservatoire were ignored, he set up his own music school, the Schola Cantorum in 1894. He wrote a large number of musical compositions including operas, overtures, symphonies, choral works, piano works, string sextets, string quartets, folk song arrangements, and a cello sonata. One of his well known works is the "Symphonie sur un Chant Montagnard Français" (1886) ("Symphony on a French Mountain Song"). He also wrote books including a biography of César Franck, and a book on how to write music. ↑ 1.0 1.1 1.2 1.3 1.4 "d'Indy, (Paul Marie Théodore) Vincent". The New Penguin Dictionary of Music. 2006. Retrieved 26 July 2011. ↑ 2.0 2.1 "Indy, Vincent d'". Chambers Biographical Dictionary. 2007. Retrieved 26 July 2011.